Tillandsia Ionantha require minimal care and upkeep and are in fact much easier to care for than most other house plants. 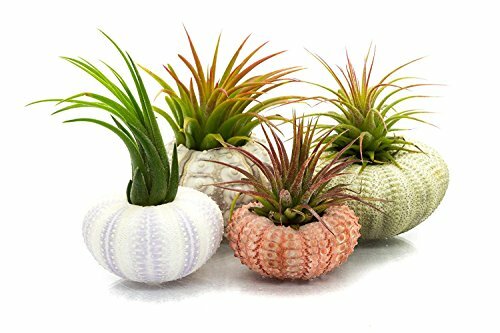 Air Plants are Bromeliads and require no soil for growing, instead they absorb nutrients through their leaves. All that is required to care for your plants is watering once a week, indirect light and air circulation. Air Plants can be grown indoors with filtered sunlight from a window or even under artificial lights such as the fluorescent lighting found in an office. Most varieties remain small at maturity and grow at a slow rate, so you don't have to worry about them out-growing the space they've been allotted. ALL PLANTS and SHELLS INCLUDED HERE ARE NON-ENDANGERED SPECIES AND HAVE BEEN CLEARED BY THE U.S. FISH AND WILDLIFE SERVICE AND CUSTOMS. NAUTICAL CRUSH TRADING is a small business dedicated to its customers. If your purchase isn't completely satisfactory, we will exchange or return it at any time. INCLUDES - (4) Variety Sea Urchins that range in size from 1 1/2" - 3" and (4) Tillandsia Ionantha Air Plants that range in size from 1"-3"
If you have any questions about this product by Nautical Crush Trading, contact us by completing and submitting the form below. If you are looking for a specif part number, please include it with your message.